This topic explains how to switch from using your current corporate license, wether it be a portable (USB key) or a network license, to the license type being used in the course. Some courses are taught with network licenses and some with temporary nodelocked licenses keyed to your computer's MAC address. 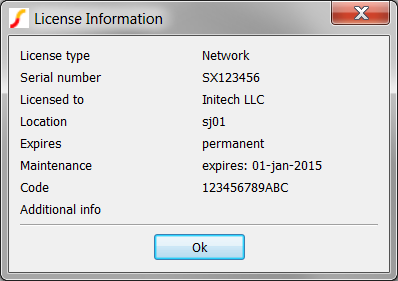 Network, where the license is located on a server. Portable/Stand Alone, which uses a USB key to connect to the license (Portable) or the license is tied to a specific MAC address (Stand Alone). In the next section you will determine which license type you are currently using. From the menu bar, select the Help > License Diagnostics... menu item. 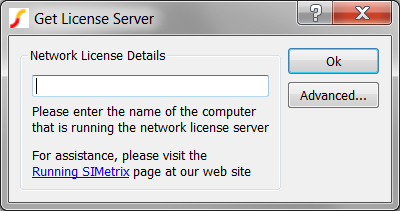 Result: The License Information dialog opens and displays your license information. 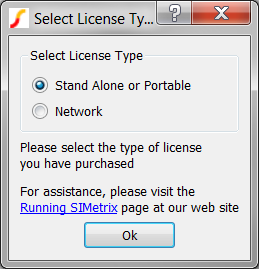 Depending on your license type, you will have the Network (left) or NodeLocked/Portable (right) license information on the dialog. Backup your license information. What to do depends on whether you have a Network or NodeLocked license. Click Ok on the License Diagnostics dialog. On this hyperlink, create_reinstall_license_script.sxscr, right click and choose Save Link As... and save the script to your Desktop. Run the script by pressing and holding down Ctrl while dragging it from your Desktop to the SIMetrix/SIMPLIS Main Window. Select your Desktop and Click Save. Result: The script file reinstall_corporate_license.sxscr is saved to your Desktop. Navigate to the Location directory listed in the License Diagnostics dialog. 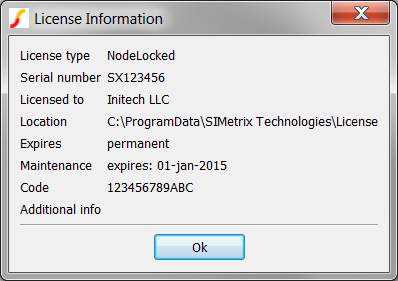 In Windows 7 and 8, this directory is typically C:\ProgramData\SIMetrix Technologies\License. On Windows XP, this directory is something like C:\documents and settings\All Users\Application Data\SIMetrix Technologies\License. Tip: On some computers the ProgramData directory is hidden, and you may have to copy/paste the directory path in the location bar of the Explorer window. Copy the license file(s) to your Desktop. These are the backup copies of your license(s). Important: If you don't backup your license information, it will be difficult to reinstall your corporate license. If the course will be taught using NodeLocked licenses, your course instructors will email you a license file keyed to your computer's MAC address the week before the course. If you have received this file, proceed to the Installing a Temporary NodeLocked License section. Otherwise, proceed to the Installing the Network License section. 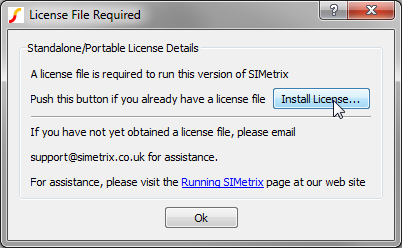 From the SIMetrix/SIMPLIS menu bar, select the Help > Reinstall License... menu item. Result: A message box opens warning you that your license information will be deleted. Click OK, then close and reopen SIMetrix/SIMPLIS. Select the license file you received via email and click Ok. Select the Network radio button, and click the Ok button. Enter 27000@192.168.91.100 in the box, and click the Ok button. Your computer is not connected to the local Intranet for the course. If you are connected to the hotel Wi-Fi, then you will not be able to reach our license server. To resolve this problem, please follow the instructions provided to you in the email to connect to our local Intranet Wi-Fi. The server name listed has a typographical error. Check the exact spelling and try again. Click Ok on the Reinstall License dialog. Press and hold the Ctrl key while dragging the reinstall_corporate_license.sxscr from your Desktop to the SIMetrix/SIMPLIS Main Window. This is the script you created in the Determine Your Existing Corporate License Information section. If you don't have this script you will have to contact your corporate network administrator to determine the port and server location. Result: Your corporate network license information is restored. A message box opens showing your port and server. 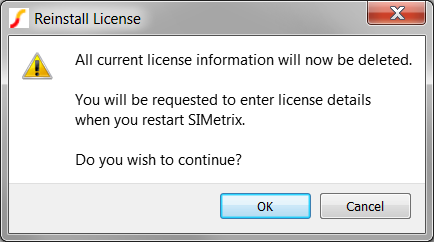 Close and restart SIMetrix/SIMPLIS to use your corporate network license. 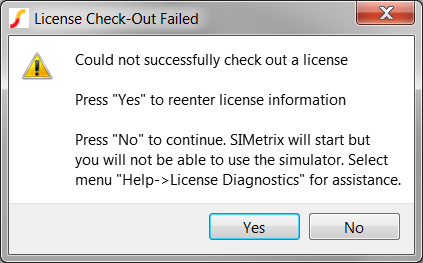 Click OK on the Reinstall License dialog and close and restart SIMetrix/SIMPLIS. Determine Your Existing Corporate License Information section. 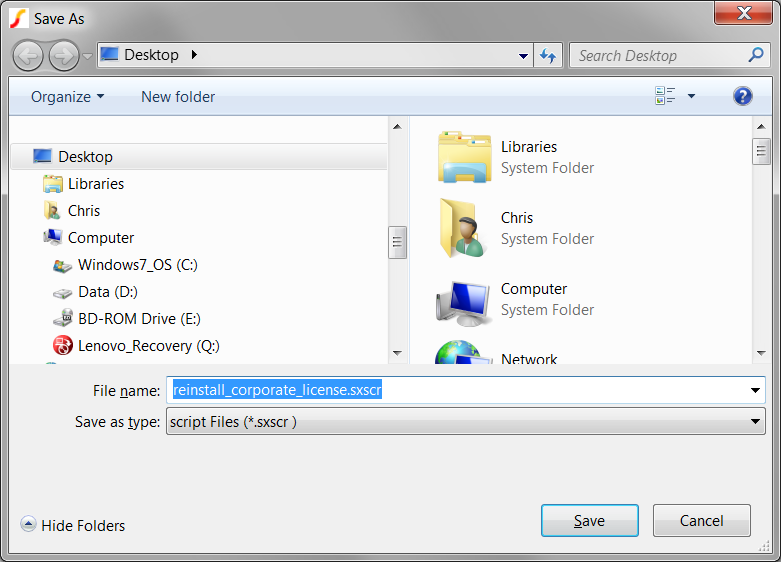 Navigate to your Desktop and select the license you backed up in the earlier step. If you have lost your backup copy, don't worry. When you selected the Help > Reinstall License... menu item, the program created a backup copy. There should be a backup sub-directory in your C:\ProgramData\SIMetrix Technologies\License directory. The program copies your current license file(s) to this directory. If a name conflict exists, the program appends an decimal and an integer to each backup copy's filename. To restore these licenses, you will have to manually rename the file to a .lic extension. The file with the highest integer extension will be the last backup copy.